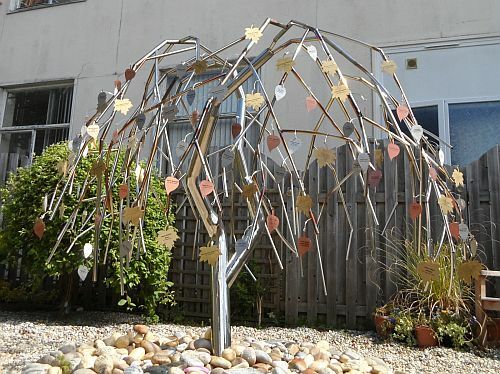 Last October one of our Customers, Gavin, from Metal Art and Fabrications, undertook the commission of Ella's Memory Tree, a stunningly designed and beautifully created stainless steel tree commissioned for Ella's Memory, a charity set up by Martyn and Emmillie Selley after suffering the tragic loss of their stillborn girl, Ella. The 2m tree, which Martin polished before colouring using heat to give a stunning rainbow effect, has pre-drilled holes from which to hang laser cut leaves. Parents can request a metal leaf engraved with a message to hang on the tree in memory, with the choice of three different leaf designs in Copper, Stainless Steel and Brass. The tree is installed at the The Royal Cornwall hospital where Mr and Mrs Selley have raised funds to refurbish the Daisy Suite and memorial garden, the aim being to try and provide a more homely setting for any parents suffering the tragic loss of a stillborn baby. We love hearing about the work our customer's do, and this project is truly exceptional. Very well done, Gavin, and to all involved. Thank you for allowing us to share this picture of your work.